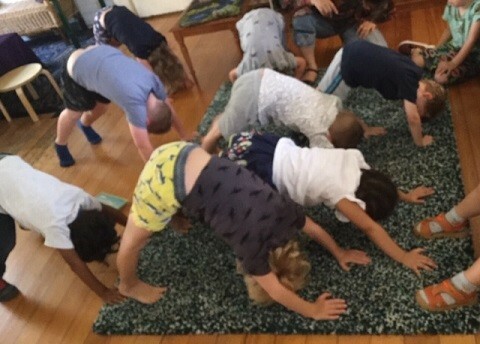 For many children in Johnson House the transition to school is starting to take place, with orientations happening, visits to local schools occurring and general discussions taking place. To support this process a space within the playroom has been set up to build on this interest and support the new transition. A range of ‘school-like’ provisions have been included in this space, such as examples of uniforms, a lunchbox, whiteboard, notebooks and pencils, and stories about starting school. 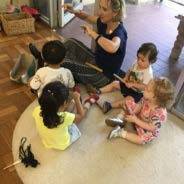 The children have enjoyed the opportunity to pretend to be teachers, as well as explore the items and engage in discussions about starting school. The children have also been encouraged to participate in ‘lunch box week’ during this time, where they have been able to practice using a lunch box just as they will at school. 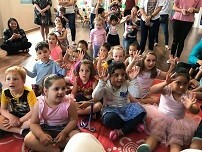 It has been a great experience for the children to participate in as they prepare for this next phase of their education. 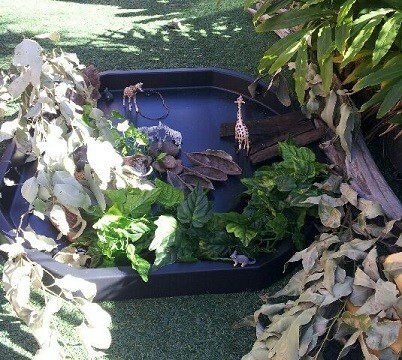 To continue to follow the children’s interest in a sensory water play, experience this week the educators set up the big tray with water and some objects including plates, cups, bowls, colanders and sponges. Some of the children showed their cleaning skills–scrubbing and cleaning some of the kitchen’s utensils, while others preferred doing some pouring and splashing. The children in Rigby House are very interested in Christmas at the moment. They talk about the Christmas things they have seen when they go out with their families and what they’re doing at home. Of particular interest to them are Christmas trees, stars and, of course, Santa Claus! Rigby House’s educators have supported this interest in many ways, including through art experiences. The children have been working with clay, shaping it with their hands, rolling it and pressing down the cutters to create shapes. When they are dry the children will paint them, and we will use them decorate our Rigby House Christmas Tree. 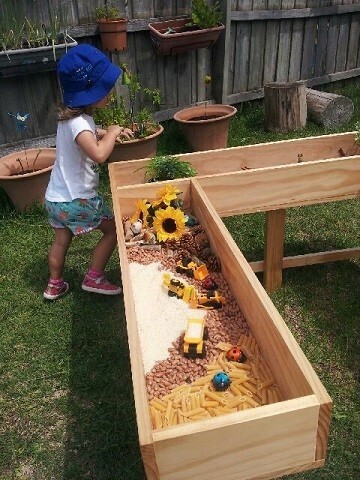 Clay is a great medium for strengthening the children’s fine motor skills. At Edurne’s Family Day Care the children enjoyed designing and making an educational ‘monster’ game using recycled and loose parts. The main focus of the game was on literacy. There were great learning outcomes involved during the process. 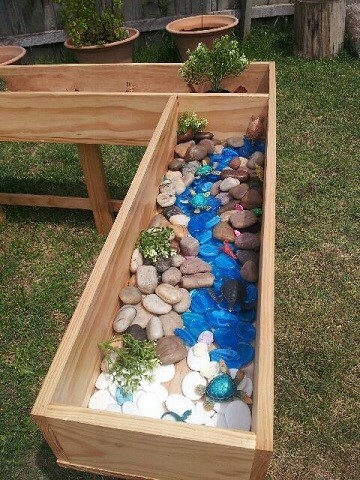 This was evident when the children worked together providing ideas for the design of the game. Everyone listened and shared their opinions about how to design the game and what recycled materials and loose parts to use. 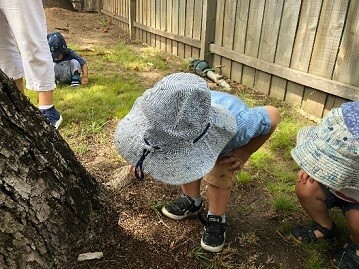 The children demonstrated a respectful and positive relationship between all group members during the design and creation process. The children developed their fine motor skills: cutting with scissors, gluing and painting. They also demonstrated good sharing skills since they had to share most of the tools. There were a lot of creative moments that led to great ideas during the process. 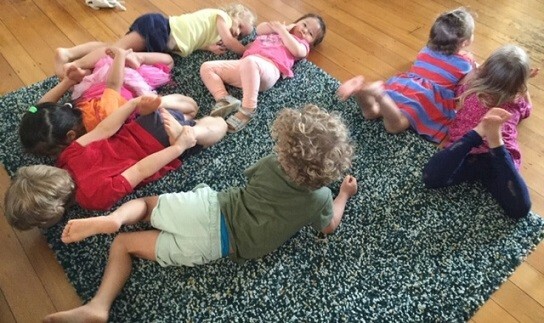 For example, when the children decided to use about twenty milk lids to create eyes, or when they decided to cut pieces of orange bags for the hair. 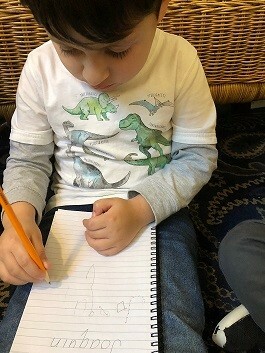 The children developed their writing and reading skills by writing words on small cards and reading them before feeding the ‘hungry monster’. The children also demonstrated great consideration for one of the children who couldn’t read, by suggesting that they could write some numbers on some of the cards so that everyone could play with the game regardless of their ability. The process of making the monster game took several days, in which the children had to wait patiently, sometimes for drying the paint or sometimes for drying the monster’s eyes. 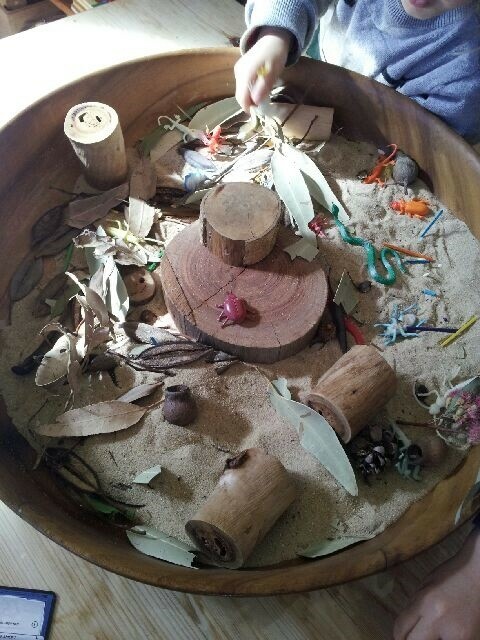 The result was a beautiful monster that the children had a great time creating and playing with it. Last Saturday was the last Fathers’ Playgroup for the year. The children had a jolly time with a special visit from Santa who come to say “Hello” to all the boys and girls. 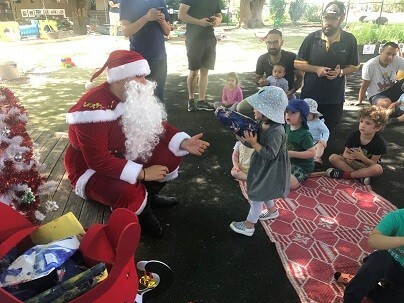 The children sang songs and danced, and the morning ended with morning tea with Santa. We would like to thank all of our Dads and Grandads for their support throughout the year. We wish you all a Merry Christmas and Happy New Year – see you in 2019! 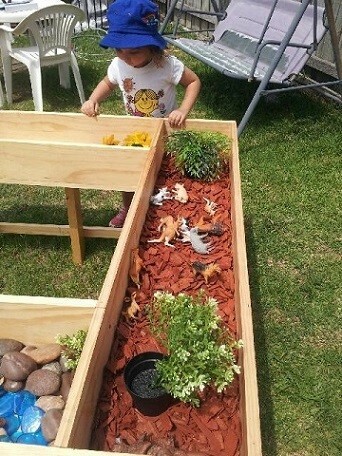 What a busy and wonderful term we’ve had at Red Bug playgroup. Celebrating the end of year we have had lots of fun making Christmas cards, Santa faces, Christmas trees and reindeer ears, with loads of singing, dancing and stories. We had Jolly Santa come and say “Hello” to all the boys and girls. Rebecca and Fiona would like to wish our Red Bug families a very Merry Christmas and a happy, safe and wonderful New Year! See you all in 2019. 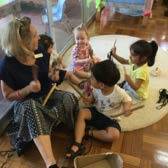 It was festive morning at Wangal playgroup this week. 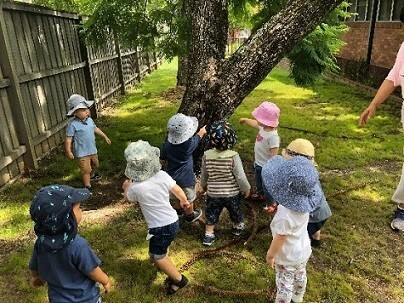 Three of our children ‘graduated’ and they are off to start kindy at Ashfield Public School next year – we wish them all the best for their next big adventure! We also had a visit from Santa and Elsa, and the children enjoyed building towers with Elsa and mailing letters to Santa, and the craft table had little fingers creating Christmas decorations to take home. The children sang and danced with Santa and finished the morning with a party which was enjoyed by all. 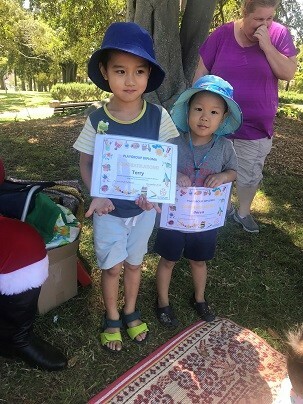 We would like to wish all our Wangal Playgroup families a very Merry Christmas – we will see you all in 2019! A joyful morning it was a Gurung playgroup. The children were surprised when Elsa come along to say hello and enjoy the morning’s activities. The children were busy creating cookies for Santa and his reindeers using playdough, and the craft table saw Santa faces being created. Christmas trees were made using blocks. Santa came to say hello and gave out gifts to all the boys and girls. 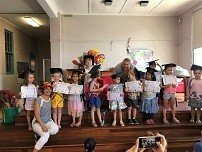 There was a graduation ceremony for 12 of our children who will be starting school at Croydon Park Public School next year. Rebecca and I wish them all the very best, and to all of our families we wish you a very Merry Christmas and a happy, safe and wonderful New Year.